Turn your Bobcat® loader into a powerful excavator with the digging force of the backhoe attachment. 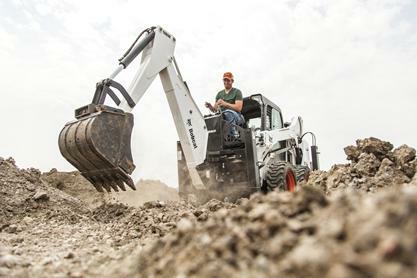 With a full line of backhoe models for all sizes of Bobcat loaders, the backhoe is a part-time attachment that can handle full-time excavating jobs. It operates with minimal ground disturbance, which is ideal for working in sensitive areas. You can also use the same buckets available for excavators. Choose the right bucket width for your job type. From the operator’s seat, you’ll have a clear line of sight into the hole, making it easy to dig accurately. Once your digging job is complete, change to another loader attachment to finish the job. The Bob-TachTM mounting system makes it fast and simple. Power through any excavation job with the versatility advantage of a backhoe attachment. Fit your backhoe attachment to your loader. Lock the latch-arms to the mounting frame. Secure the safety chain. Hook up the backhoe to your loader’s auxiliary hydraulics. Then attach your bucket. Multiple bucket widths are available to fit any excavating job size. When you’re done, easily load the attachment into your trailer. Digging Depth: With a full line of backhoe models for all sizes of loaders, the backhoe attachment features digging depths from 6 to 11 feet, ideal for maximizing the combination of excavating performance and carrier versatility. Easy to Transport: Moves from one job to the next with ease, allowing maximum attachment use without hassle. Excellent Down-Hole Visibility: Offers clear visibility when operating the backhoe attachment, allowing for more efficient and accurate operation. X-Change Mounting Attachment System: Multiple excavator bucket widths offer the best fit for any excavating job size.